Breville Boss To Go Review - Is It the Top Personal Blender ? Breville Boss To Go Review – Is It the Top Personal Blender ? Breville makes some great kitchen appliance products and they entered into the personal blender market in 2016 with its sleek looking Breville Boss To Go BPB600BAL Kinetix Blade and Bowl System. It has a sleek design and solid feel to it, but the big question is how does the Breville Boss personal blender perform ? In this Breville Boss to Go review, I will discuss its features, how it performs, and how it compares to other personal blenders on the market. The Breville Boss To Go has a slim, modern design and comes with two unique smooth-edged tumbler cups (16oz and 23oz) with travel lids. The premium BPA-free Tritan plastic tumblers are shatter-resistant and dishwasher-safe. It is worth pointing out that the tumblers are thick and feel sturdier than the cups provided from other similar personal blenders. The smooth rim on the Breville to-go cups are a really nice design and the lids screw on for easy on-the-go use. This blender is marketed as having a unique Kinetix Blade design that uses a combination of serrated and curved sweeping blades to simultaneously cut and pull ingredients down for a smooth blending experience. It is interesting to note that the Boss blender blades aren’t actually sharp to the touch which is how highly-rated Blendtec blender brand blade system works. Breville products are always well built and the To-go blender base is made from a heavy die-cast metal to give it a sturdy feel. Also, the Breville Boss blender uses a metal driveshaft compared to a lot of competing brands that use plastic gears. A nice design feature is they created a notch where the cup locks into the base motor so that any spilled liquid can drain out which is a great idea. The overall design is nice and provides simple hands-free operation. The Breville To Go works similar to other popular personal blenders in that it provides a single-speed motor that engages when you twist the blender cup onto the base. To stop blending, you just untwist the jar. The downside of not having multiple speeds is you have manually twist the jar on and off to pulse the blender. The reviews are strong regarding Breville’s Boss To Go performance and independent tests gave it good marks. Raw kale is a tough ingredient to puree for many blenders and is used as a test ingredient for many green smoothie blending tests. In June 2015, Breville performed an independent lab test at the University of Sydney using the same amounts of Kale and water. The test results showed average particle sizes from the Breville Boss To Go as being up to 27% finer than the NutriNinja BL480 and up to 42% finer than the Nutribullet 600w. Although to be fair, the Breville has 1000 watts of power vs the Nutribullet 600 watts. I think a better comparison would be against the Nutribullet Pro 900 watt blender. For speed and power, the Boss is similar to other popular personal blenders like the Nutribullet Pro and Nutri Ninja which we compare farther below. In Sweet Home’s personal blender comparison tests, the Breville Boss To Go outperformed the other blenders in pureeing difficult ingredients like kale and berries with seeds. These are 2 types of difficult to puree ingredients that are commonly used in blender comparison tests. Overall, the Breville Boss To Go ranks near the top among personal blenders for performance but there are some design concerns from users which I mention in the “negatives” section below. Positives: When it comes to blending, the Breville Boss To Go Plus delivers in performance and consistency. It has a solid heavy feel with clean design. The containers are thick and have a very solid feel to them. It has high reviews from many customers and the few independent tests on the blender were positive. The Breville does cost more than the similar Nutribullet and Ninja personal blenders with the same 1 year warranty but some users feel the blending performance of the Breville is worth it. Personally, I like the Nutribullet Pro 900 which has performs well and costs about 40% less than the Breville. I do love the quality of Breville products and I use a Breville juicer but the Breville Boss To Go design complaints mentioned above are worth considering since it only has a 1 year warranty. (Also, you could get an inexpensive extended warranty for peace of mind if you do decide to get Breville). Overall, the Breville offers excellent performance but my only complaint is I wish the Breville Boss offered a longer warranty period since it is priced higher price than competing blenders. As mentioned earlier in this article, Breville markets how an independent lab test found that the Breville Boss blended 42% finer than the Nutribullet 600 watt blender, but I feel Nutribullet Pro 900 watt blender model offers a better comparison than the Nutribullet 600. 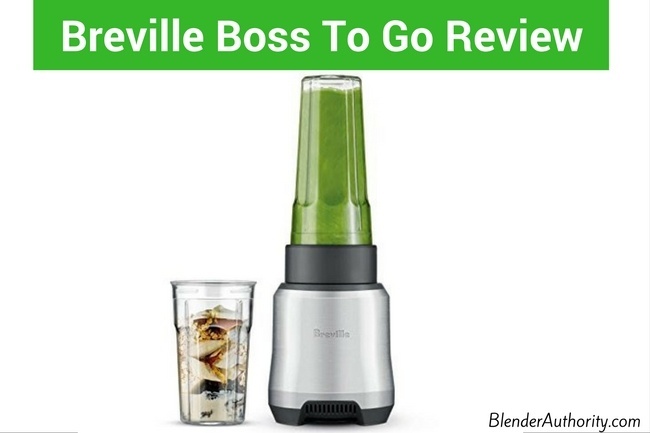 The Sweet Home did an extensive comparison test of personal blenders and chose the Nutribullet 900 as their top pick with the Breville Boss as a close runner up. Their reasoning was that while the Breville Boss did blend slightly smoother drinks for certain ingredients they thought it wasn’t enough to justify the 60+% higher cost of the Breville Boss vs NutriBullet. The power is similar between the two blenders and the Nutribullet Pro does offer a larger 32oz container vs Breville Boss’s 24oz. The larger 32oz container is nice for holding enough raw ingredients to create a full meal replacement size smoothie. The Nutri Ninja with auto-IQ Blender has power of 1000 watts which is similar to Breville To Go blender. It’s special Auto IQ technology offers various programmed blending programs and has a useful pulse function. The Boss To Go only has a single speed and you need to manually unscrew the jar on and off to simulate a pulsing function which can require some hand strength. The Ninja comes with a larger 32oz jar versus Breville’s 24oz jar. Ninja has sold 100,000’s of their personal blender and people continue to give it high ranks. The build of the Ninja doesn’t feel as sturdy as the Breville Boss but offers the same power, decent performance and features for the price compared to the Breville. I personally don’t care for the Auto IQ blending functions as I like having manual control over how long I blend, but many customers love the Auto IQ function. If you are mostly making smoothies then you would be fine without the controls. If you are trying to decide on the Nutri Ninja vs Breville Boss then I like the Breville just slightly more because of how well it blends. Although, for some people it might not be worth the extra cost of the Breville for the slight difference in performance. Also, many people love Ninja’s hands-off Auto IQ programs so it is really up to how you think you will use the blender. Click Here to read more reviews about the top selling Ninja Auto IQ model. When it comes to performance, the Breville’s Boss To Go is a top performer for personal blenders. It creates very fine smooth drinks and it has a nice quality feel to it. It does have some a small number of complaints about the design of how it locks into the base and it might be something of concern about the long term reliability of that design since the product has only been in the market for a couple years. I personally prefer the Nutribullet at a lower price with similar performance but the Breville is a very close competitor. Breville is known for quality but I wish this blender had a longer warranty period. For extra peace of mind, it might be a good idea to buy an inexpensive extended warranty past the initial 1 year Breville manufacturer warranty period. 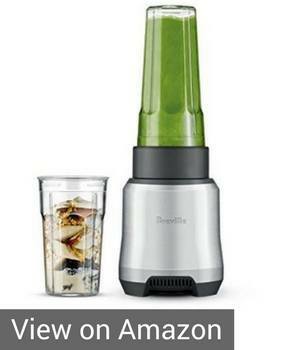 Overall, if you want the smoothest green smoothies then the Breville To Go blender is a top choice. Thank you for your excellent review. I am leaning towards buying the Breville Boss To Go because of its blending superiority and quality construction. I already have a Breville Toaster Oven and love it immensely. My only concern is what I read about the hand strength needed to turn the cup. I have some arthritis in my hand and I’m a bit concerned. Is this a minimal glitch in the strength needed vs. the Nutribullet pro 900 (my next choice) ?? Hi Bonnie, You are right the Breville Boss can tighten up when blending thereby creating a tight seal. I too love the quality of construction and performance of Breville products and generally think the Breville Boss is a good choice. Many of the personal blenders create a tight seal and hand strength can be a concern because the blade assembly width can be hard to wrap the whole hand around. If you watch the Breville video above at the 2:38 mark you can see how he does have to use some strength to get the base off. I don’t find the Nutribullet hard to unscrew(The 600 and 900 models) but the Rx which has a wider base is harder. Otherwise a top loading counterop blender might be a better choice for you if hand strength is a concern for you since you don’t have to unscrew it everytime. The Jamba Quiet Shield Blender(see review) might be another option for you since it is smaller than many countertop blenders but uses a top loading pitcher(also comes with a personal size container) and quiet powerful for the price.